Would an open Twitter be feasible? I would get in touch with other client developers and start talking about a way to do what Twitter does but that doesn’t require Twitter itself (or any specific company or service). Once we came to a consensus, then we’d add support for whatever-it-is to our apps… And then we’d promote the new thing, encourage people to use it, help it grow. Then drop Twitter some day — or wait till Twitter cuts off our apps. 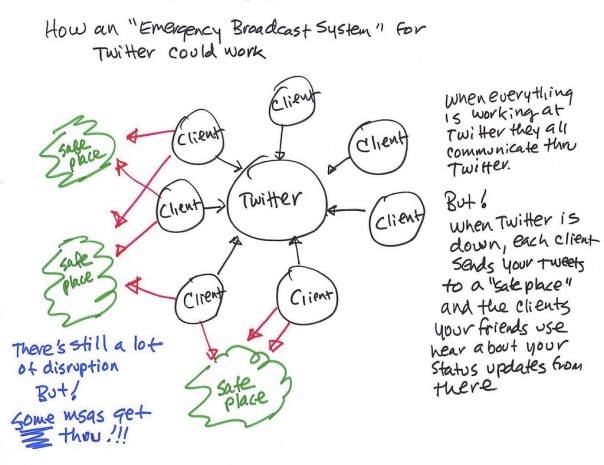 Simmons points out that the technical elements required for a short-messaging service like Twitter, in which users can “follow” each other to get updates pushed to them, aren’t all that complicated (although the company might argue that it’s a lot more complicated when you get to hundreds of millions of users and have to handle billions of simultaneous tweets every few days). A service that did this wouldn’t be all that different from the way that RSS operates as a news-distribution format, Simmons said, and a simple OPML file could be used to handle subscribing or unsubscribing from different people. But would an open Twitter have a hope of actually becoming an alternative to the real thing? Maybe two or three years ago something like that could have worked, but Twitter is now a massive network with over 100 million active users, and that’s a pretty powerful reason why people would tend to keep using the existing service. Not only that, but Twitter can and likely would do whatever it could to stop a competitor from emerging, just as it tried to stifle entrepreneur Bill Gross’s attempt to build a competing network through his company UberMedia. In addition to Winer’s efforts, one company already tried to build an open-source version of Twitter: Status.net developed a client and service called Identi.ca, which was based on a model similar to that of the blogging platform WordPress (see disclosure below) — users could run the software on their own servers and connect to the network that way, or they could use a hosted version run by Identi.ca. After a lack of uptake, apart from some die-hard programmers and the occasional celebrity, the company wound up pivoting to focus on a corporate information service similar to Yammer. Diaspora, an open-source alternative to Facebook that was funded through a high-profile Kickstarter campaign in 2010, has suffered a somewhat similar fate: it has been criticized for not developing quickly enough, and seems to be used primarily by hobbyists, and others for whom the principle of an open network is more important than whether anyone else uses it or not. In the end, many users don’t really seem to care whether a system or network is open or not — or at least not enough of them to make a difference. Disclosure: Automattic (maker of WordPress.com) is backed by True Ventures, a venture capital firm that is an investor in the parent company of this blog, Giga Omni Media. Om Malik, founder of Giga Omni Media, is also a venture partner at True. OpenBTS (Range Networks, BurningMan cell service for 10,000) is out there, and if OpenBTS is possible, then Not Twitter is possible. Where we are all failing is in perpetuating the industrial era stove-pipe of isolated corrupt analytics. My new book, THE OPEN SOURCE EVERYTHING MANIFESTO: Transparency, Truth & Trust, addresses where we need to go now–right now–to break away. Microsoft, Oracle, Google, Facebook, Twitter, are all twisted manifestations of corrupt capitalism with rotten feedback loops (information pathologies. We need to cleanse the global information system, and in my view, OpenBTS and Open Non-Twitter is the way to start. *hust* What’s about identi.ca or Status.net? It’s open, free, why aren’t we using it? Interesting that this article has far more twitter shares than any other network. Am equally as frustrated with the ongoing social networking wars, Twitter is just one of the culprits (blogged on this yesterday on allthingsanalytics dot com), however rather than seeing a single Twitter open source alternative, I would rather see many specialist networks pop-up, with aggregation clients on top that allow me to choose which networks I want to interact with – it might be pinterest for interiors, google+ for technology, twitter for entertainment, getsatisfaction for customer feedback, etc. For 20 years users of the net have shown that they will happily jump off a bandwagon for a better bandwagon. Facebook and Twitter’s biggest enemy is buying into the notion that they are too big to fail. AOL, CompuServe, Myspace, etc, etc, etc thought that as well. Nick, I agree. 1% of twitter users tweet(create content), 10% curate and the rest 89% listen/consume tweets. Biggest problem for tweet consumers is the information overload. If a new product could solve this problem faced by 89% of twitter users(89% of 140million active users they claim = 124 million ) there is a chance they could win. I agree Nick, and you can add to that list a plethora of technology companies from Novell to Kaypro, Digital Equipment, and Wang to Imation and thousands of software makers from Multi-mate to [fill in the blank]. ‘Open Twitter’ (minus) ‘twitters Information overload problem’ should definitely work. Twitter is great for broadcasting but consuming tweets is a big big pain. Any alternative communication platform that could solve this problem should get mass adoption. Twitter clients provide a great backdoor to Twitter. The users of Twitter clients create a large amount of the traffic to Twitter and would be able to recreate a new ‘network’ themselves. Twitter knows this and has been buying companies that create clients, so they have the biggest part of these clients under their own control. 1) federated by design – just like email, you choose your buddycloud provider and all servers find and talk to eachother. 3) open source reference implmentation with a permissive licence (https://github.com/buddycloud). While Twitter suffers from the “marketers shouting at marketers” Tweet-and-forget, the buddycloud team has tried to foster a more conversational model akin to the threads one sees on G+. The “how will you reach critical mass” problem cited in the article is solved by growing out of topic channels – user follow topics and then connect with other users around each topic. I follow the idea of an open “Twitter” also for a while now. The service Twitter provides has much of a public good and should therefore also publically controlled/available rather than served by a company. The obvious problem is that we do not know how Twitter’s biz model will evolve over time. But I would go a different way as scribbled above. Status.netâ€™s outcome doesnâ€™t disprove the advantages of federated, open micro-blogging (OMB) platforms. Instead, it shows the risks of a developer-driven business model that under funds and under emphasizes the roles of marketing and keystone clients. Four aspects of Identi.ca made it difficult to use. First, Status.net failed to set out or enforce an anti-spam policy. Spam flooded the platform, driven in part by SEO advantages that Identi.ca (indexed by Google as a true blogging service) had over Twitter, which doesnâ€™t provide much SEO juice. Power users could have helped self-police Identi.ca but were not provided opportunities for contributing. Second, readers receive all @ replies posted by everyone they follow, regardless of whether they follow the intended recipient. This is maddening and stupid. Third, with no built-in link shortener, Identi.ca is tedious and unpredictable as a Twitter client when URLs are involved. Last but not least, the people at Status.net never fully grasped the social aspects of microblogging. This made it difficult to find and connect with others and to use the OMB platform in an efficient manner. In the end, Identi.ca turned into a Twitter client for Iranians using it to avoid Tehranâ€™s ban on direct access to Twitter.com. Lacking localization and language-detection features, Identi.caâ€™s leaderboard is largely or entirely in Farsi. Thereâ€™s no buzz or excitement for non-Farsi readers on Identi.ca any more. The brilliance and humor of the old community has disappeared. The challenge isn\â€™t replicating the functionality of Twitter (or Facebook) in an open source environment â€“ the challenge is really building adoption and critical mass, which is something few open or closed projects manage. I suspect Identi.ca and Diaspora both face the same problem, in that just being the open source alternative isn\â€™t enough to attract a mass of people, as the majority of non-developers don\â€™t really care about the code, or even privacy, compared to ease of use, and where the majority of their friends and family are. Having said that, if an open source project was combined with a decent USP for \â€™normal\â€™ users, there\â€™s no reason why it couldn\â€™t succeed â€“ after all WordPress, Linux etc have all built decent or in the case of WordPress, amazing followings. I know this sounds terribly cheesy but I always assumed the mass public would insist Twitter become a public entity or something open would evolve into an open system. I guess it depends on how much the general public really wants and cares about a free and open flow of information using the technology that is available to us all.